Trefhedyn Garden Centre gardem emporium in Newcastle Emlyn. Trefhedyn Garden Centre resides on the main retail street in Newcastle Emlyn. It is a real emporium of garden and pet products that can enthrall you for hours. Many of the plants come from their own nursery. Trefhedyn Nursery was started in 1976 with a couple of green houses behind the owners home.This was in response to the difficulty they were experiencing in obtaining plants to sell. There was a reluctance on the part of wholesalers to deliver so far afield. The Trefhedyn Nursery site occupies 1 and half acres and is at Maes y Meillion near Prengwyn. The public can buy direct but it’s a working Nursery. Prices are the same as in our shop. Roger from Trefhedyn speaks about their forthcoming Seed Potato Festival: Did you realise that during the 1980’s and 1990’s we lost a generation of vegetable growers. Growing veg slowly disappeared and everybody turned to flowers. However the crash and subsequent recession of 2008 changed everything and hallelujah we were suddenly propelled into the world of veg gardening a whole new generation decided to get out their tools and dig for food. Fantastic news because people came in for advice and that makes our job so more interesting lots of questions and talking people through what to grow and how to grow it. The main reason for people to start growing their own was to save money. Well that’s a big no no. You will never save money but what you will achieve is flavour, quality, and you know where and how your food is growing. This led us to start obtaining more and more varieties of veg and herbs and also to expand our seed potato range. We have sold probably about a dozen varieties over the years you all know King Edward and Desiree but due to the expanding grow your own market Scottish seed growers started to bring back some of the most flaversoume old varieties and with this in mind we started the Trefhedyn seed potato festival. Here we bring together nearly 100 varieties of seed potato to give every gardener the chance to experiment because even the humble potato has a wide variety of flavours. We try to help as much as possible during our weekend of potatoes, so not only do we advise how to grow but every year we find new recipe’s such as chocolate potato cake which I can assure you is very nice. And finally a super modern variety which is probably a bit late arriving. We now have potatoes that are blight resistant which go under the sarpo brand name and my favourite is sarpo Mira which makes the most fantastic perfect chips but it would seem Nobody makes chips anymore whatever happened to all those deep fat fryers. However to learn more about growing potatoes and many many more vegetables do come Along to our seed potato festival February 6th and 7th and have a good old chat with us all. The Potato is the main source of nutrients for a balanced diet. Potatoes have everything you need – they are full of vitamins and nutrients, and best of all they are low in calories, contain no cholesterol and are naturally fat-free!Fabulous! You couldn’t ask for more! And the best thing is, they’re easy to grow – trust me, I grew several varieties last year and I struggle to remember to feed my houseplant! The first thing to do is to decide on which variety you want to grow – First Earlies, Second Earlies or Maincrops. Harvesting your potato crop depends on when the seed was planted, the weather and on the variety of seed potatoes. First Earlies: harvest in 65-100 days, normally June/July. When the first flowers appear on the foliage this is a sign that there are edible tubers beneath which are ready to be harvested. Second Earlies/Salad Potatoes: harvest in 100-130 days, normally July/August. Maincrop: harvest in 125-180 days, normally September onwards. Allow the foliage to die back, allowing the skin to set, and then harvest. These can be stored if lifted in dry conditions. Store in hessian sacks in a cool, dark, frost-free area. Blight is a disease that affects crops in mild, moist weather conditions during the mid-summer to autumn period. Luckily, potato blight occurs too late in the season to affect your crop of first early seed potatoes, however special care and attention must be taken when growing second early or maincrop varieties. Small, dark patches will first appear on the leaves, these patches may then spread to the stem of the plant thus infecting the tubers. The infected tubers will then start to rot. Unfortunately infected tubers cannot be saved, but all is not lost! You can save the remainder of your crop by spraying all plants with a solution of either Copper Mixture or Fruit & Vegetable Disease Control (formerly known as Dithane). Not enough space in the garden? Then how about Grow-in-a-Bag! Growing seed potatoes in containers such as tubs, barrels and potato bags is becoming more and more popular. Not only is it popular, its easy too! We should know, all the girls at Trefhedyn grew seed potatoes in ‘Spud Bags last year and produced a variety of scrumptious Spuds. First step, place a layer of compost (6inches deep), we recommend ’Arthur Bowers Potato Compost’, at the bottom of the bag then place 5-6 chitted seed potatoes in the soil (2inches deep). Then wait for the magic to begin! In about 7-10 days (longer if the seed potatoes have not been chitted) small shoots will start to appear, wait for these to reach 6 inches tall then cover the base of the plants with a layer of compost, leaving the tips showing. Repeat this process every 4 inches until the shoots reach the top of the bag. Be sure to keep the soil well watered at every level. Every layer should be kept moist, do not leave to dry out. Once the shoots reach the top of the bag leave the shoots to produce a wonderful mass of foliage, not forgetting to water and feed regularly. We recommend feeding with Doff Liquid Growmore. The first earlies will be ready to harvest in June/July when flowers appear on the plants. The second earlies will be ready in July/August. Maincrops will be ready in August/September/October, wait for the foliage to die back(this allows the skin to set) and then harvest. My trick was to tip out the contents of the bag and have fun rummaging through the soil counting how many wonderful potatoes I could find. Enjoy! Below is a list of all the varieties we currently have in-stock, all varieties are sold at £1.99 per kilo, 3 kgs for £5.00. Bulk quantities are also available, 25kg for £22. This coming week the team at Trefhedyn will go to the wilds of Tregaron to choose our Nordman Fir Christmas trees. This variety is by far the best for retaining their needles and will last for up to 4/5 weeks in the house. In fact I have seen trees thrown out after the festive season with plenty of needles left on the following spring. The problem we have with this variety is that they are very slow growing, however the slow growth also helps in the needle retention as the tree naturally retains moisture. We do our best to have local trees and over the next 10 years their will be more and more welsh trees available which will mean we can keep prices under control without having to worry about transport costs. We also have the traditional Norway spruce, I say traditional as this is the tree we all grew up with watching the needles fall off before christmas. However all our spruce are from Carmarthen and are cut fresh which does help somewhat in needle holding but ideally this variety should not be brought into the house untill a day or 2 before christmas. If you have room why not plant a growing tree? Outdoor varieties such as the Colorado Blue Spruce a large growing variety growth about 1ft pr year or Picea Albertiana ‘Conica’ a dwarf variety max height 6ft. There are a lot of pines to plant as well but you will need a good deal of room for any one of those. 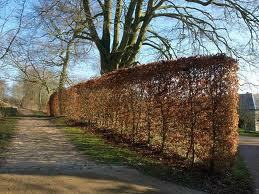 Let us not forget our lovely beech hedging which is extremely hardy and keeps its rich brown leaves through the winter. November is also the month for trees all sorts of ornamental trees from acer’s to weeping willows, it’s a great month for choosing and planting a tree for the garden. My favoutite week is in mid november when all our fruit trees arrive from the rich fields of cambridgeshire approxamately we have 80 varieties of tree fruit including apples, pears, plums, cherries, then peaches, nectarines, apricots, walnuts, medlars, quinces and not forgetting raspberries from scotland and all our soft fruits black, red and white currants and a mass of berries to clamber over walls and hedges. All in all november is a fantastic gardening month and that is without planting all the spring bulbs. Below is our extensive range of bare root hedge plants, many of these are native. Bare root plants are the most economical & traditional way to plant a hedge. Please note that bare root hedge plants are only available from November-April. We strongly recommend using rootgrow™ to enhance & hasten establishment of young bare root plants. Hawthorn(Quickthorn) Crataegus Monogyna: Hawthorn is a traditional, fast-growing, thorny, native hedge which produces scented white flowers followed by red haws in the autumn. 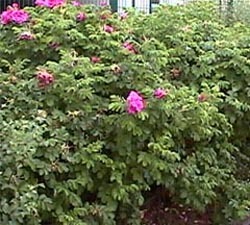 The hedge becomes very thick and dense in a short period of time, hence the name. Hawthorn is a very hardy hedge & is useful in coastal areas & exposed sites. Will also tolerate damp areas.To obtain a thick hedge we advise you to plant 5-7 plants per metre. Blackthorn Prunus Spinosa: Blackthorn is a dense, prickly, deciduous and tall thorn hedge which is ideal for windy areas. Blackthorn will grow in all soils, except waterlogged soil, but it is not suitable for shady areas. White flowers blossom early in the year & are followed by sloes in the autumn for October-November harvesting. 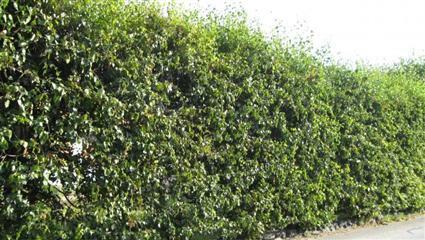 To obtain a thick hedge we advise you to plant 5-7 plants per metre. Hazel Corylus Avellana: Hazel is a large, fast growing hedge which produces long, yellow catkins followed by edible nuts in the autumn. 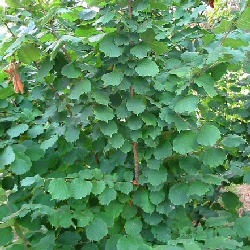 Hazel tolerates shade & windy/exposed sites, & will grow in moist soils. Ideal to plant with Thorn. To obtain a thick hedge we advise you to plant 7 plants per metre. Beech Fagus Sylvatica: Beech is a slow-growing, native but dense hedge which offers superb foliage all though winter.It is deciduous but if trimmed annually in August the leaves will usually be retained in a dry state throughout most of the winter. Beech tolerates most soils except heavy clay. Copper Beech is best planted in full sun to retain the colour. Beech is best planted in sheltered sites, away from frost pockets. To obtain a thick hedge we advise you to plant 7 plants per metre. 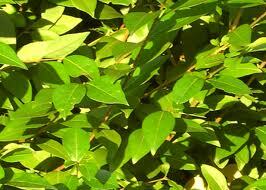 Privet Ligustrum: Privet is a traditional, evergreen hedge which bears glossy foliage. Privet will tolerate most soil types apart from wet locations. Ideal as a screen for privacy or as a windbreak. We advise you to plant 5 plants to the metre. Rosa Rugosa: Rosa Rugosa is a rapid growing, dense, deciduous and prickly hedge which produces highly scented pink, white or red flowers in the summer, followed by hips. Rosa Rugosa will grow in most soils apart from waterlogged areas. An ideal hedging plant for coastal areas. Ideal to prevent unwanted visitors in the garden. Norway Spruce Picea abies: Norway Spruce is a traditional christmas tree & forms a fast-growing, evergreen hedge which thrives in many soil types, especially acidic soils. 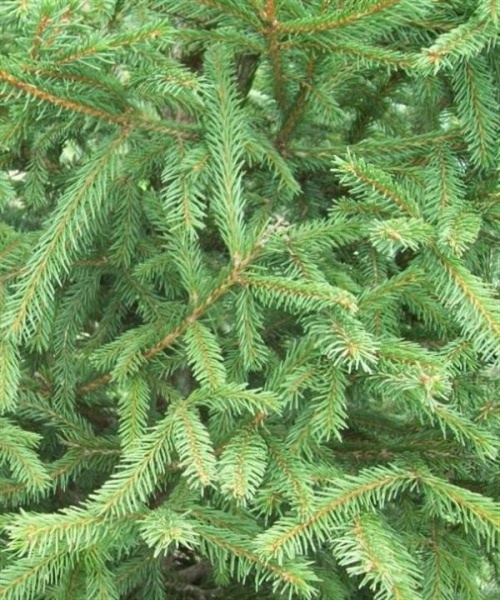 Norway Spruce is suitable for windy/exposed sites but is not suitable for coastal & waterlogged areas. Hornbeam Carpinus Betulus: Hornbeam is a hardy, native, semi-evergreen hedging plant. It is similar to Beech however it tolerates poor soils & exposed sites better than Beech. 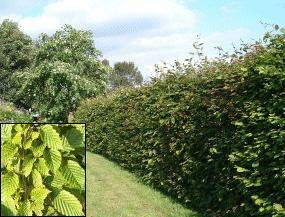 Hornbeam is suitable for wet & clay soils but it is not suitable for coastal areas. Crab Apple Malus: Malus produces a colourful hedge – pink flowers emerge from red buds in the spring & crab apples appear in the autumn. Malus is a native, hardy, deciduous hedge & will tolerate dry & exposed areas. Best grown in full sun. Alder Alnus Glutinosa: Alder is a fast-growing, native, deciduous hedge which bears glossy leaves followed by woody cones in the autumn. Alder grows best in moist/wet soils & will tolerate all soil types except from very chalky soil. Grows well in coastal areas. Alder keeps its leaves quite late, often until November. Silver Birch Betula Pendula: A fast-growing, native, deciduous hedge. Silver Birch prefers light, free-draining soil & copes well in exposed sites. 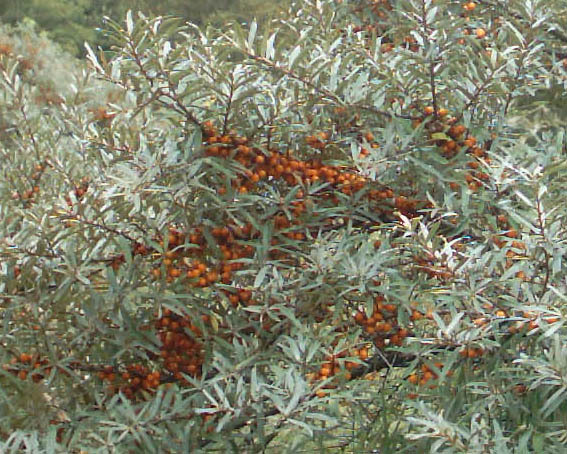 Sea Buckthorn Hippophae: A fast-growing, native, deciduous, thorny plant which thrives by the sea. Hippophae is suitable for shady, dry & exposed areas. It produces masses of orange berries in the autumn suitable for making marmalade. 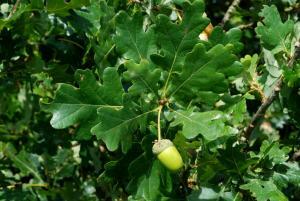 Oak Quercus: Oak makes an excellent hedge especially in coastal areas. Oak provides a good windbreak but it is not suitable for cold, inland areas. Need help finding the right hedge?